In Europe spaetzle is largely considered a “Swabian speciality” and is generally associated with the German states of Baden-Wuertttemberg and Bavaria. Before the invention and use of mechanical devices to make these noodles, they were shaped by hand or with a spoon and the results resembled Spatzen (meaning little sparrows, sparrow is Haus-Spatz or Sperling in German). 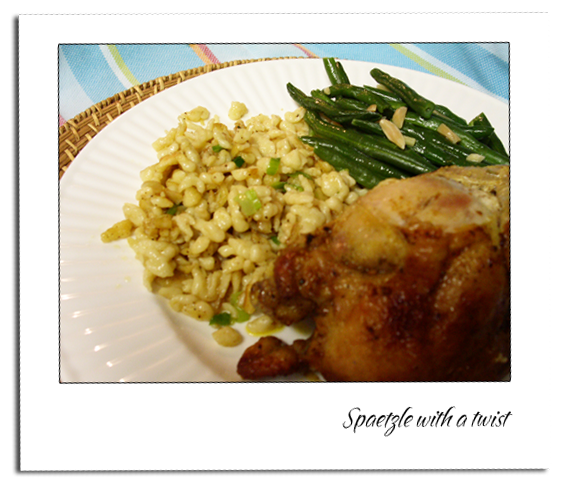 Spaetzle dough typically consists of few ingredients, principally eggs, flour, and salt. Often, water is added to produce a thinner dough. 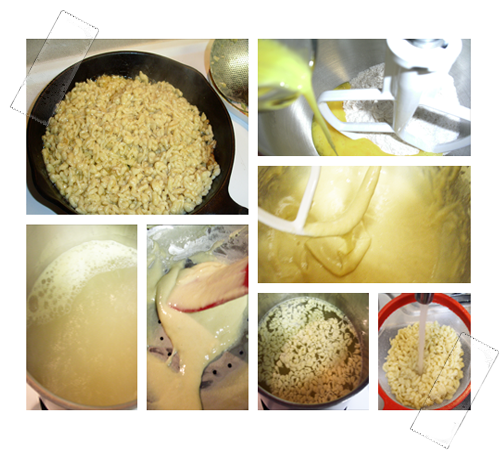 Traditionally, Spaetzle is made by scraping dough off a wooden chopping board (Spaetzlebrett) into boiling salt water where they cook until they rise to the surface. They are then skimmed and put aside. several devices were invented to facilitate cooking that resemble a strainer, (or colander), a potato ricer (“Spaetzlespresse”), a food mill or coarse grater (“Spaetzlehobel”). Like with scraped Spaetzle, the dough drops into the boiling water. Since I don’t own one of those devises I just used the regular colander and spatula. Fill a large pot half way full with water. Add 2 tbsp chicken base or 2 bouillon cubes to the water. In the meantime add 2 beaten eggs, 3/4 cup of milk and salt to the flour in the mixing bowl, mix well. When the bouillon starts to boil put your colander on top of your pot. Pour the spaetzle mix in the colander and push it through with a spatula. The spaetzle is ready when it’s floating to the top. Take the spaetzle with a skimmer out of the bouillon and rinse with cold water. When you are finished making the spaetzle put some butter in a skillet and add your spaetzle to the skillet. This is just to brown it a bit. You don’t have to fry the spaetzle, you can put the spaetzle in a bowl with some butter. For variety you can add some chives, garlic, green onion, or some cheese. Sprinkle with some salt and pepper. In Europe spaetzle is largely considered a "Swabian speciality" and is generally associated with the German states of Baden-Wuertttemberg and Bavaria. Before the invention and use of mechanical devices to make these noodles, they were shaped by hand or with a spoon and the results resembled Spatzen (meaning little sparrows, sparrow is Haus-Spatz or Sperling in German). Fill a large pot half way full with water. Add 2 tbsp chicken base or 2 bouillon cubes to the water. 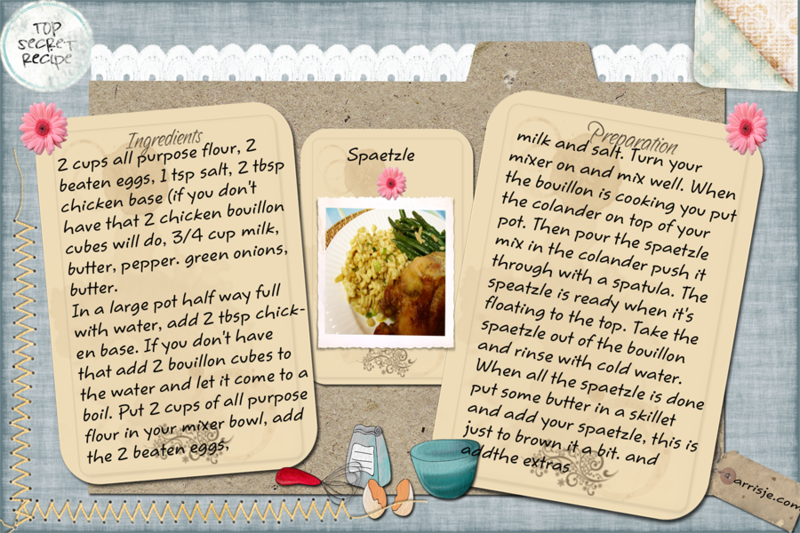 In the meantime add 2 beaten eggs, ¾ cup of milk and salt to the flour in the mixing bowl, mix well. When the bouillon starts to boil put your colander on top of your pot. Pour the spaetzle mix in the colander and push it through with a spatula. The spaetzle is ready when it's floating to the top. Take the spaetzle with a skimmer out of the bouillon and rinse with cold water. When you are finished making the spaetzle put some butter in a skillet and add your spaetzle to the skillet. This is just to brown it a bit. You don't have to fry the spaetzle, you can put the spaetzle in a bowl with some butter. For variety you can add some chives, garlic, green onion, or some cheese. Sprinkle with some salt and pepper.